Screen Printing Emulsion Plus7000 1000ml is a very high quality (HD), medium/high solids emulsion that is resistant to both water and solvent based inks. For incision screen printing frames. Excellent definition and ease of use. Very high print quality, 34% solids. Deep blue/green colour provides excellent colour contrast without compromising see-through. The diazo dual-cure photochemistry used provides exceptional resistance to solvent based, water based and UV curable inks. The good water resistance also means that PLUS 7000 can be used in areas of high humidity with no softening. 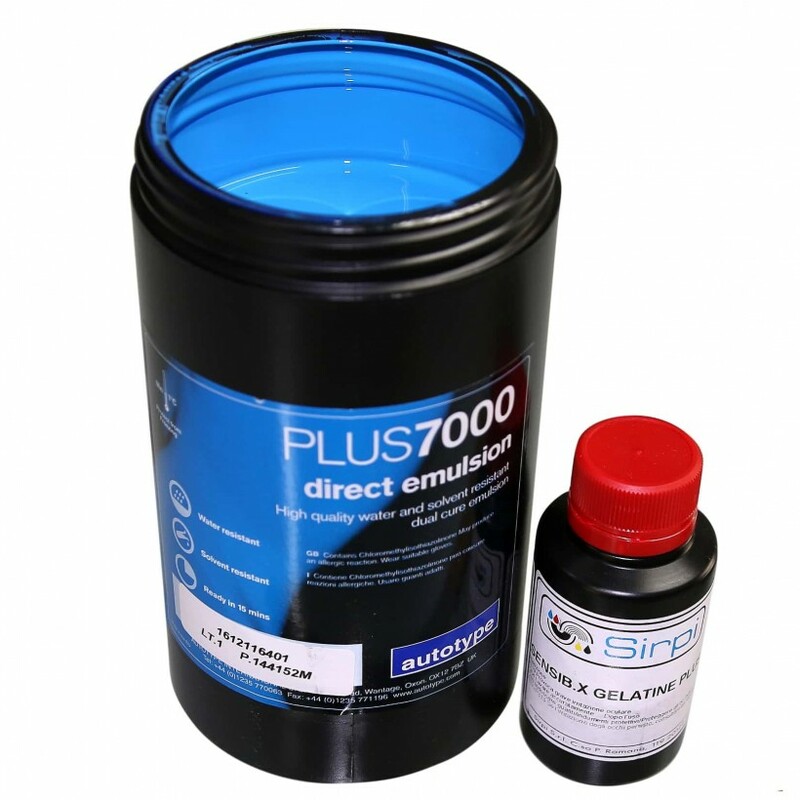 Although universally resistant PLUS 7000 can also be decoated using Autostrip. Easy and forgiving to use, very good print definition, very tough, can be used with virtually any ink and can be decoated after printing. See section 'How to use PLUS emulsions' for detailed advice. Questo prodotto, come tutti gli altri, sono di ottima qualità. assistenza pre e post vendita eccezionali. Precisione e puntualità! Ottimo prodotto, semplice da preparare e usare. Risultato perfetto sul telaio, consigliato! Ottima resa, resiste a qualsiasi prodotto. Very happy with this emulsion, will be back for more! Do you have any questions about Screen Printing Emulsion Plus7000 Autotype 1Kg?